Antisemitic Based Conspiracy Theory, Pretending to be History!!!! "Planet. 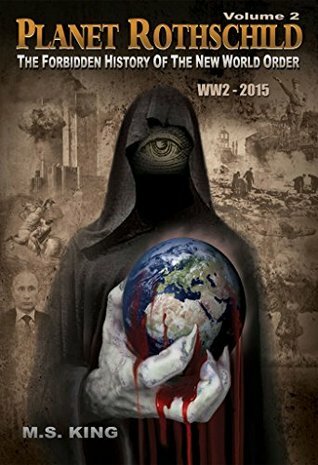 Rothschild, Volume Two, World War Two-2015, is the second of MS King's two Volume opus "true history" of the Western World, 1763-2015. According to the author there is a dark, criminal syndicate that has conspired to alter the course of key historical events since the 1770s. The author identifies the perpetrators, and ththe British Jewish Rothschild Dynasty, the most powerful and richness Jewish family in the world, in league with the French and Austrian branches of the syndicate, along with Rothschild banks in 90 + countries. Their agents influence American, British, French, Austrian, German,...every western nations' politics and finance. Together with other Jewish banking dynasties (Schiff, Warburg, Baruch, Lazard et al) and their Anglo-American allies and agents (Rockefeller, JP Morgan et al.) they form the beating heart, the snakes head, of the Globo-Zionist-Jew House of Rothschild and the self perpetuating New World Order crime syndicate. In Volumn 2, the author asserts that the Jewish Rothschild crime sydicate used underhanded plots and criminal dealings and financed actions which have influnced almost all key historical events from World War Two to 2015: Exanples described by the author include: the horrible, unjust, World War against Hitler's Germany, Italy, and Japan; the Cold War; the JFK assassination; the Vietnam War; the civil rights movement; the "women's movement"; the Global Warming Hoax; the 9/11 attacks; the "War On Terror"; and the looming confrontation with Russia and China. The common thread of the New World Order (NWO) crime gang links all of these events together! the NWO Conspiracy top objectives are: establishment of a Rothschild syndicate controlled, Jewish and rich elitist dominated, one world government; to destroy Christianity; to wipe out the Caucasian race by breeding them down with Jews and other dark races; and to establish total hegemony over the western world. Throughout this book the author provides new truths, facts and clears up what he calls distortions and even lies about historical events. The author has a great deal of new "truths" to share and reveals that many of the facts and ideas that we believed to be true are actually lies. Frequently I found his new truths mostly impossible to believe. Thinking I might be in denial I fact checked much of the author's facts, and verified to my satisfaction that the author was throughly mistaken. To tell you much more would reveal more than is necessary regarding the content of this book. It took me more time than usual reading both volumes of this work, while trying to research & validate the author's claims. I was driven by the desire to determine the reason for the hundreds of 5 star ratings and rave reviews! What ever the reason my efforts were not rewarded. This book is heavy on empty verbiage and contains a heaping dose of the author's antisemitic, neo Nazi, paranoid, and delusional ultraconservative "personal" opinions and rhetoric. The book is light on documented fact, truths, mixed profusely with half truths and outright lies. This book is simply a misguided and racist revision of history. I will not recommend this book to anyone to read!!! If you do read it check out his facts. Following is a list of my primary issues with Mr King's book.1. Mr. King writing reflects a real problem with Jews. His comments regarding Jewish people cross over the line to antsemitism. 2. Analyzing historical events or chain of events claiming, without documentation, these events are caused by the manipulation & agitation by the Rothschild Crime Syndicate, or its agents.3. Misuse of source documents, claiming they are proof of something they are not.4. Uses documentation that has been proven to be false or of questionable validity, e.g. The Red Cross Document Stating 270,000 Jewish deaths in German Camps with knowledge the numbers were provided by the SS running the camps.5. Ignores documents or evidence that is contrary to the author's narrative.6. Constantly defamation and name calling when refering to people he dislikes such as F D Roosevelt as *red" "commie", or "murderer"; Churchill as a " mad dog" " drunkard" "traitor". 7. Ignores or rejects historical facts or proven truths.8. The author mixes his opinion with historical facts to support his narrative, if the facts don't fit he slides in words like myth or "court historian" to cast doubt on the facts, and pump up his version of the truth. Frequently he disregards facts and substitutes the truth with his opinion. Most vexing of all examples of this are his apparent love afair with Hitler and the bogus "facts" to support his Holocaust denial!9. The author's Bibliography is a picture listing of books. In order to validate comments from these sources it would be necessary to read the entire book. I also question the use of his own books, as proper sources of validation.10.The footnotes are not in accordance with style guide and are difficult to use. If I haven't read Vol. 1, would this 2nd Vol. flow pretty good with, "The Bad War?"